Raw spinach has a mild, slightly sweet taste that can be refreshing in salads but when it is cooked, its flavour becomes more acidic and earthy. Savoy has crisp, creased curly leaves that have a springy texture. Smooth-leaf has flat, unwrinkled, spade-shaped leaves, while semi-savoy is similar in texture to savoy but is not as crinkled in appearance. Baby spinach is great for use in salads because it has a sweeter taste due to its lower oxalic acid content. • Excellent source of vitamin K.
In animal studies, researchers have found that spinach may help protect the brain from oxidative stress and may reduce the effects of age-related related declines in brain function. Research indicates that eating a spinach rich diet significantly improved learning capacity and motor skills in adults. 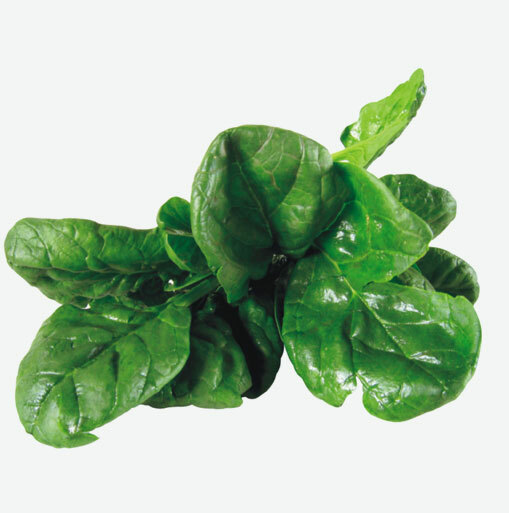 Choose spinach that has vibrant deep green leaves and stems with no signs of yellowing. The leaves should look fresh and tender, and not be wilted or bruised. Store fresh spinach loosely packed in a plastic bag in the refrigerator crisper where it will keep fresh for about five days. Do not wash it before storing as the moisture will cause it to spoil. Avoid storing cooked spinach as it will not keep very well. Spinach should be washed very well since the leaves and stems tend to collect sand and soil. Before washing, trim off the roots and separate the leaves. Cut away any overly thick stems to ensure for more even cooking. Spinach can be quick boiled for one minute. Boiling will help to reduce the amount of oxalic acids found in spinach, resulting in a sweeter taste. Toss steamed spinach with pressed garlic, fresh lemon juice and olive oil. Replace spinach for basil in pesto recipes and make spinach pesto.